The Amish European Corner Hutch takes command of a quiet corner and adds stunning solid wood storage and style. 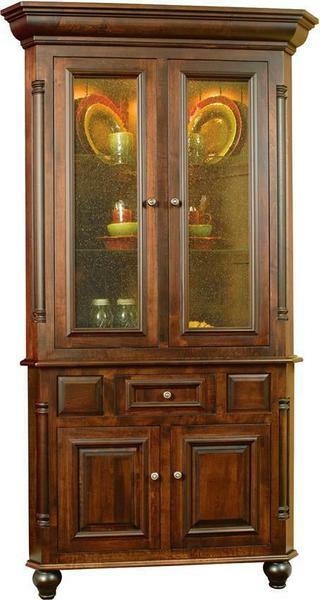 From the impressive molding to the side columns to the raised panel doors, this wood hutch is a true gentleman. Refined and sophisticated, the long top cabinets are warm and welcoming with glass doors showcasing the contents. The Amish European Corner Hutch is shown here in brown maple wood. Add custom storage with a cabinet you'll love. DutchCrafters helps you every step of the way to customize solid wood furniture with the features and functions that serve you best. Email or call us today with any questions. Thank you for shopping with DutchCrafters.